Brook Cottage stands in the grounds of Brook House - both taking their names from the winding brook which travels through the adjacent fields of our property. Stearsby is a small hamlet situated in the beautiful Howardian Hills of North Yorkshire. Just 20 minutes from the outskirts of the historic city of York and only an hours drive to the east coast for Scarborough and the lovely fishing town of Whitby. For quieter destinations the unspoilt beaches of Sandsend and Robin Hoods Bay are a must. Traditional market towns of Easingwold, Malton Thirsk are also on the doorstep providing great pubs and eateries. Close by are also the attractions of the famous Castle Howard , Yorkshire Lavender Farm and Flamingo Land. The countryside is stunning and great for cyclists and walkers alike so please feel free to bring your bikes. 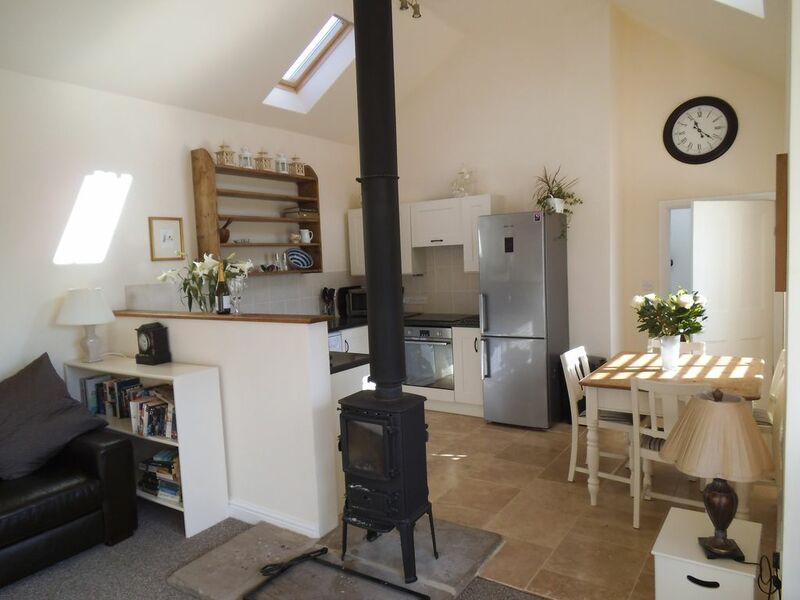 The old stables are single storey and have been sympathetically converted recently resulting in a very light and airy property yet cosy at the same time. South facing French doors make the most of the view and the sunshine. The two bedrooms are at opposite ends of the cottage which makes it the ideal configuration for two couples sharing or families with children. One bedroom has a king size bed (all 100%cotton bedding) and an ensuite whilst the second bedroom is usually set up a twin bedroom. (this can be changed to a superking 6 foot bed by prior request. This bedroom is next to the generous main bathroom which has a bath and shower over the bath. The living area has a double height ceiling, beams and double sided log burner for those cold winter nights. The cottage has the use of a small private garden which is accessible from the bedroom or the drive to the front of the cottage. There is ample parking for 1 or more cars. This cottage can also be booked with nearby Hobbits property reference 8496786 which sleeps 2 people. Great for families who want to holiday together but want a little independence and privacy. please note our booking diary runs from Friday to Friday for weekly stays . We can accomodate greater flexibilty in lower seasons. Both bathrooms have heated towel rails. Bathroom 1 is spacious and could accomodate a wheelchair if necessary. Ample parking for 1 or more cars. If more than two please let us know. Double sided log burner. A starter pack of wood is provided. Additional wood can be bought from the owner or locally. Small but with lovely open views and sunsets . Private . Bicycles are NOT available but secure storage is available if you wish to bring your own. If you could let us know in advance that would be a great help. Lawned and gravel area with outdoor dining furniture. Access from the bedroom and the drive drive. The property is single storey on one level .Good access through main door or french doord. Ample adjacent parking. There is also access to the garden throug the bedroom door. Beautiful cosy cottage in stunning location. The cottage is very well equipped. It was spotlessly clean and comfortable. Lindsay and Marcus are wonderful hosts and very helpful. We had great days out within a short drive to York, Castle Howard, the Moors and the coast. Dear Jackie and family. So pleased you enjoyed your stay at Brook Cottage. A lovely homely property, situated in a very quiet hamlet. Ideally situated for visiting Castle Howard and National Trust property’s. Also York and Thirsk. So pleased you enjoyed your stay . A very well equipped cottage with lots of places to visit in the area. The York park and ride makes visiting the city so easy. Thank you Malcolm . Very pleased you enjoyed your stay. 1. the WC in the en-suite shower room was particularly low and I therefore needed assistance to stand after using it. Fortunately, my daughter living over nearHull was able to order a 6" raised toilet seat from Argos . This was delivered the following day. 2. the en-suite shower room was completely bare - no ledges or shelving for a toilet bag or toiletries, no rails and no shower mat. The floor was slippy when using soap and shower gel. Fortunately I had my own suction handle and rubber shower mat with me, otherwise I would not have been able to use the shower room at all. Hope you had a lovely holiday in Egypt. So pleased you enjoyed your stay at Brook Cottage. I an sorry we could not accomodate on the WC and shower handle front. We will bare this in mind though. There were shower mats in the bathroom cupboard for the bath and shower - perhaps we should have made this more obvious . There is a glass shelf and window sill in the ensuite suitable for toiletries but iI appreciate you can never have enough storage! We will look in to this. Do hope this did not spoil your stay and that we might see you and your frinds again. The cottage was perfect, immaculate and very cosy, well equipped kitchen everything you needed for your stay here. Marcus and Lindsay were most helpful with recommending places to eat and both recommendations were perfect. Lovely cottage and lovely owners. Lovely guests too.! So pleased you enjoyed your New Year break. Brook Cottage was perfect for a week getaway, and is located in an area really close to shops if needed and days out. We managed to do something everyday with the leaflets that Lindsay and Marcus provided us with and the guide of places to visit. We would thoroughly recommend staying here again, the fire pit was just luxurious on the cold winter nights. This is a must visit cottage and is perfect for just a couple or family too! I would not recommend any improvements, everything was spot on. Many thanks for you kind review. Look forward to seeing you again in the future and good luck to you both .